Parents Opposed to Pot represents parents whose children have been killed or indelibly harmed because of marijuana. The stories of are on the websites. Of course the destruction is greatest to those who begin as teens, but there’s also a potential for damage from pot for people who begin as adults. Legalization tends to increase teen usage and keep the black market alive. In Colorado parents are trying desperately to educate children and teens against marijuana usage, but their messages can’t compete against the messages of the marijuana industry. The deaths of Levi Thamba (Colorado), Shane Robinson (California), Andy Zorn (Arizona), Hamza Warsame (Washington), Luke Goodman (Colorado), Daniel Juarez (Colorado), Kristine Kirk (Colorado), Tron Dohse (Colorado), Brant Clark (Colorado), Michael Ziobro (New Jersey) and Brandon Powell (Oregon) are directly related to smoking or ingesting pot. Our groups also represent parents of children who have been in treatment but appear beyond revival. They may spend the rest of their lives wandering, homeless, jobless, psychotic, or in jail. It’s a cruel fate. There were 460,000 ER calls for marijuana in 2010, more than for any other drug, a reason the FDA refused to reschedule it. These visits weren’t related to addiction treatment. So even before two states voted to legalize in 2012, the evidence was strong that marijuana is an extremely harmful drug. 2) They created front organizations that are patient advocacy groups. With the advocacy groups, they began to hire KOLs (Key Opinion Leaders) to educate doctors and the public. 3) They lobbied Congress, to NOT ALLOW the DEA to go after the drug distributors. The Marijuana industry —which you are a part of –is following the same playbook right at the moment. On I-5 near Lakewood, two weeks ago- a man drove high on marijuana and Xanax and caused another car to flip. Three were killed instantly including Jaime Vidal Pelayo,30, of Kelso, Sherry Rodriguez,44, and Martin Rodriguez, 51, of Longwood. Marijuana (6.8 ng) was found in the driver responsible for three teen deaths in Lynnwood last July 26th. Those who died were Landon Staley, 16, Travin Nelson-Phongphiou, 16 and Mikayla Sorenson, 15. Another teen was seriously injured. On Halloween, 2014, 7-year-old Cadence Boyer was struck on the sidewalk and killed by a stoned driver in Vancouver, WA. Her mother, friend and friend’s mother were also injured while trick-or-treating, but survived. In May 2017, Cheyllyn Collinsworth, 18, Centralia,was killed by a stoned driver, shortly before her high school graduation. On January 11, 2015 a 17-year-old from Bremerton, WA, drove 75 mph while stoned and killed his three classmates who were in the car. In Bellingham, in June, 2015, a daily marijuana smoker drove into 4 students walking to PE class at 9:30 in the morning. Gabriel Anderson, 14 and Shane Ormiston, 18, died. On July 4, 2015, a stoned driver killed Jennifer Berry on I-5 near Olympia. He was allegedly driving 120 mph. On May, 24, 2016, near Kent, a 7-year-old was paralyzed when a stoned 15-year-old girl drove a BMW illegally and crashed into his dad’s truck, splitting it into three parts. Providence St. Peter’s Hospital in Olympia, Washington, reports one or two new psychosis patients every day. Most of these people use “dabs,” and many of them will be roped into the mental health system, perhaps for a lifetime. Marijuana of the 21st century is highly potent, nothing like it was in the 70s, 80s and 90s. At least two people died in Butane Hash oil explosions, one in Bellevue and one in Spokane. The BHO explosion in Bellevue displaced people in 12 apartment units. For proof that legalization doesn’t keep marijuana away from teens, note that 9 of the deaths caused by marijuana use described here involved use of marijuana by those under the legal age limit which is 21. Although marijuana doesn’t cross the brain stem, meaning it does not act like the drugs that cause acute overdose, it has been known to kill people through heart attacks. An 11-month old baby died this way, and we know 5 examples of young adults. Anyone who is supporting legalization is encouraging a drug that causes preventable deaths-deaths from suicide, psychosis, mental illness, addiction and car accidents. Please study Sweden for drug policy and talk about what that country does. Sweden closed half its jails by reducing drug usage, not by increasing drug usage. Anyone who told you that US incarceration rate would be solved by legalizing marijuana is deliberately lying and misleading you. The United States is not like European Countries, in that it is less moderate and full of extremists in nearly every way. So why are you talking about following a European model and misrepresenting that model? Europeans have only decriminalized drugs, and the Czech model is not even successful. Study after study has shown that marijuana is a drug that induces people to commit violence. The United States has less than 5% of the world’s population and nearly 60% of the drug users in the world (includes off label abuse of prescription drugs). In one study of criminals in jail for murder who used marijuana, 25% of them believe they never would have committed murder if they had not used marijuana. And former Seattle Police Chief, Gil Kerlikowske, commissioned a crime study and found 80% of crimes were committed while on drugs. Marijuana was involved with 58% of crimes in Chicago and Sacramento. Some people make a big deal about the fact we that the US has about 25% of the world’s prison population. We have nearly 60% of the world’s illicit drug users — which connects to why so many people are in prison. We know car theft, robberies, murders and traffic deaths would go down, if we eliminated marijuana use, but we cannot estimate the extent it would go down. Those who wish to legalize have spent a long time trying to confuse the public so that they don’t understand the difference between decriminalization and legalization. Smart Approaches to Marijuana has information showing that legalization and incarceration are not either/or choices. Presenting to the public the idea that there is only a choice between legalization and incarceration is deceitful. The results have been tragic, with 74,000 overdose deaths last year. People in the age group of 25-34 are dying at a rate that is 5x what it was in 1999. Many were addicted to pot before they started using heroin or fetanyl, and more than 70% began their illicit drug use with marijuana. People often brag to us about not being harmed by pot. However, we never hear from the parents, siblings, children and spouses that “my _—- has been using for _______ and is not harmed.” We hear terrible stories that families share about pot use by relatives. We have received letters from children who resent their parents’ pot use and say it has made them feel unloved. You and others who smoke marijuana and believe it is not causing problems, are either incredibly lucky or lacking self awareness. Please answer this letter, check out the science and apologize to the people who have been harmed by marijuana legalization. You obviously don’t know the medical studies and you would not be advocating for legalization. 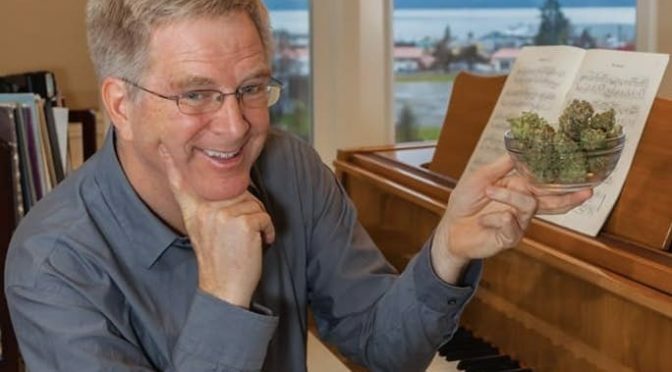 Rick Steves did not respond to our letter, dated March 22, 2018, sent to his office in Edmonds, WA. He spoke last week in Ann Arbor and Grand Rapids, Michigan, on behalf of the Marijuana Policy Project’s ballot referendum to legalize marijuana. Based on Steves’s disrespect for the families of those who lost their lives to this drug, we recommend a boycott of his travel company. We ask that PBS stations around the country stop carrying his program.